ALTER BRIDGE Stream New Track "My Champion"
Heroes push us to excel. Their will, courage, and sacrifice can bring out the best in the world around them. Fittingly, on their fifth full-length album, The Last Hero, hard rock juggernaut ALTER BRIDGE pursue a level of excellence inspired by timeless heroism. That mantra is showcased in the track “My Champion” and the band unveiled a lyric video via worldwide premiere that can be seen below. 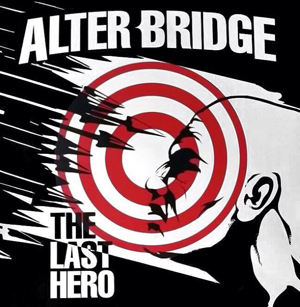 “My Champion” is the second track released from ALTER BRIDGE’s upcoming fifth studio album, The Last Hero. The album is scheduled for worldwide release on October 7th by Caroline Records in the United States/Canada and Napalm Records throughout the rest of the globe. The album is now available for pre-order via iTunes, Amazon and Google Play. Fans who order the album will receive an instant download of “My Champion” and the debut single “Show Me A Leader”. The album is also available in various fan bundles at www.Alterbridge.com/store. The Last Hero was produced by longtime friend and collaborator Michael “Elvis” Baskette (SLASH, TREMONTI, TRIVIUM, etc) and mastered by GRAMMY® award winner Ted Jensen. ALTER BRIDGE is heading out on select U.S. headline dates in support of The Last Hero this coming September and select ticket purchases will come with a digital album. The headline run kicks off September 22nd in Destin, FL. The tour will make stops in San Antonio, TX; Minneapolis, MN; Lincoln, NE; Charlotte, NC; and Nashville, TN. The band will also perform at a few festival dates this Fall including the inaugural Houston Open Air Festival, Sonic Boom, Louder Than Life and the Tulsa State Fair. Tickets for their U.S headline dates are on-sale now via ticketmaster.com.